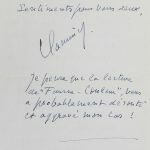 Autograph letter signed, octavo, two pages, dated 29 March 1957, from Vlaminck to Marcelo Anchorena, thanking him and his wife Hortensia for lending the memoirs of the Duchess of Windsor. He will return this and other books when he has finished reading them. He remembers a short visit they made. He makes a brief remark about a book called ‘Fausse-Couleur’. With its original envelope, postmarked 30 March 1957 and addressed to an apartment in Paris with the return address, all in his own hand.